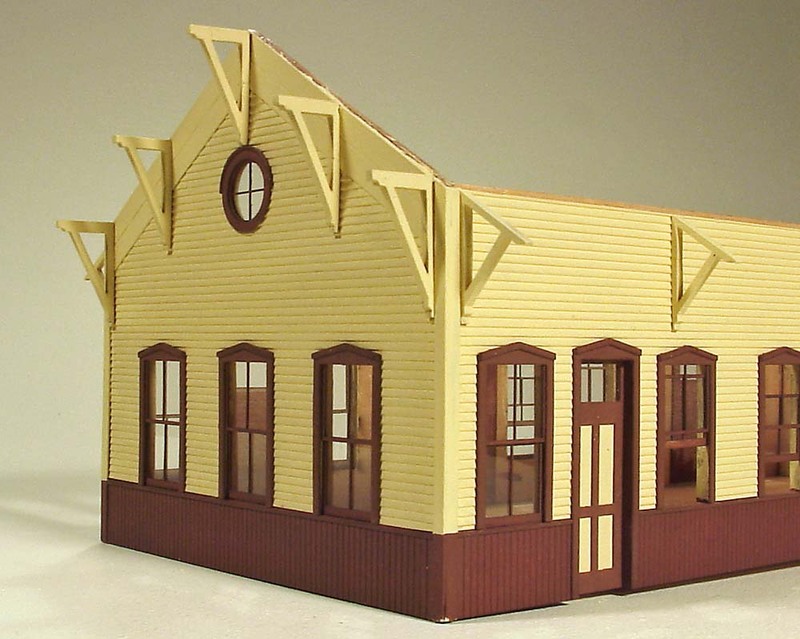 This article features the construction of a Silverton Depot kit that was offered by Banta Modelworks. 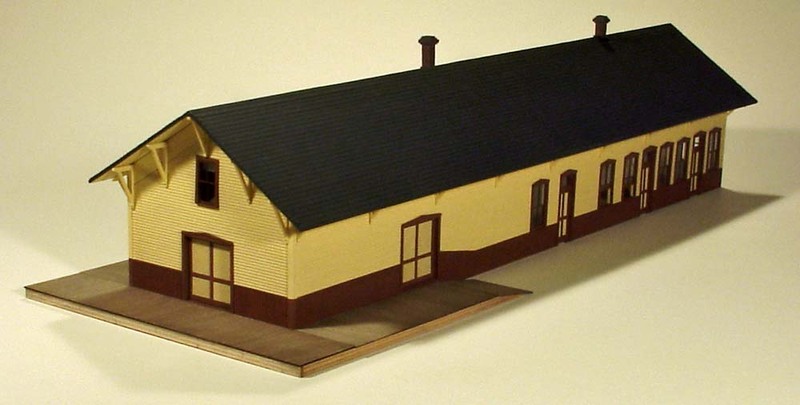 This is an abbreviated version of a Product Review article that originally appeared in, "Sn3 Modeler Magazine," and includes additional images that were not included in that review. This is the basic structure with windows, doors and most of the exterior lap siding panels in place. There was a slight problem with one of the end wall pieces. That wall was taped into position for these photos and replaced when the replacement piece arrived. The roof panels, minus the laser cut shingle material, have been set in place for this photo. Guide lines to align the paper shingle material have been laser cut into the panels. Here's a view of the baggage end wall and some of the components that are awaiting to be attached. 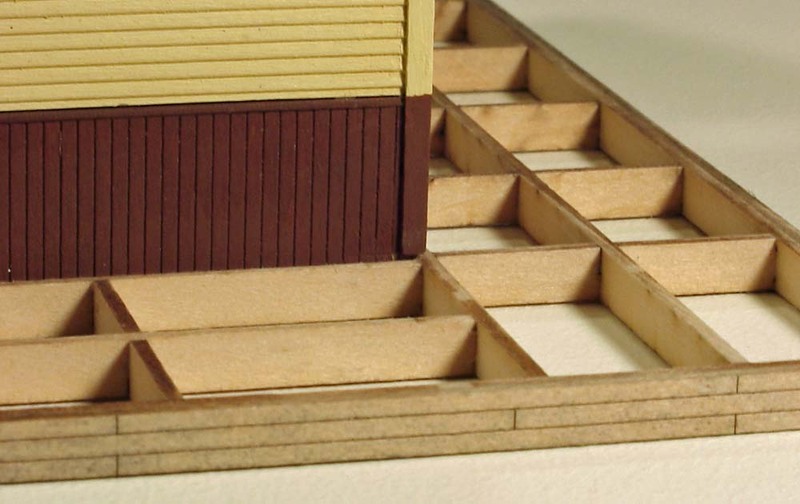 As with much of the structures in the Banta Modelworks line, there's an inner wall and an outer veneer of various components. 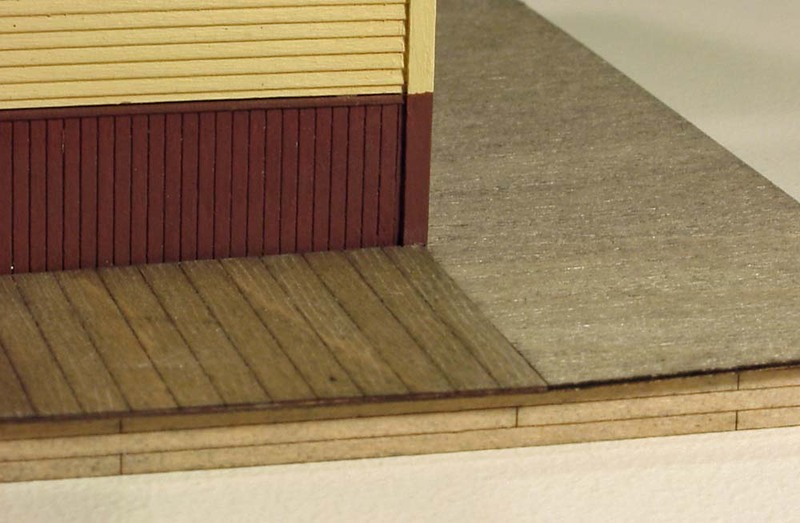 In this case, the wainscoting is attached, then a thin laser cut sill cap strip and finally the laser cut scribed siding. 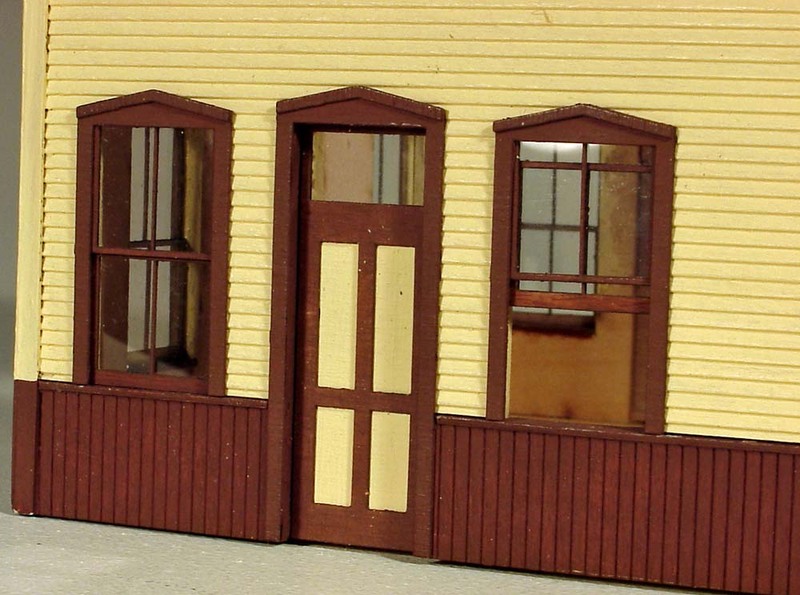 Doors and windows are added later. 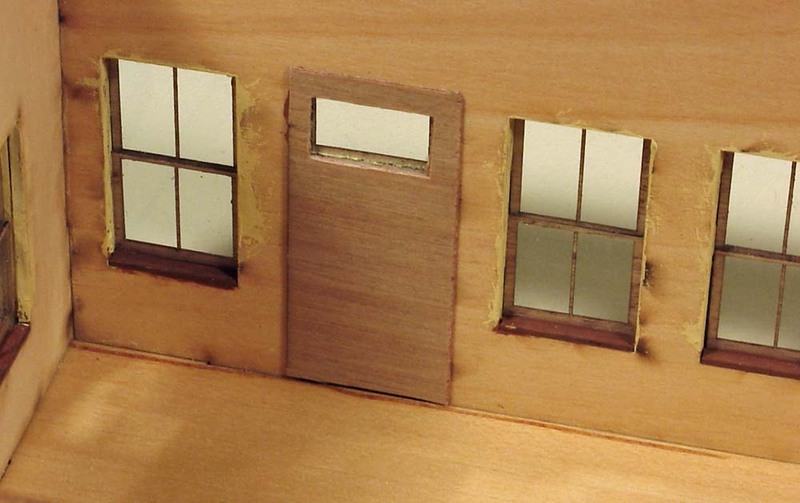 One of the features common to most laser cut window styles is the ability to position the lower sash in either a totally closed position or an opened one or anywhere in between. This view shows three of the lower sashes installed at various settings. 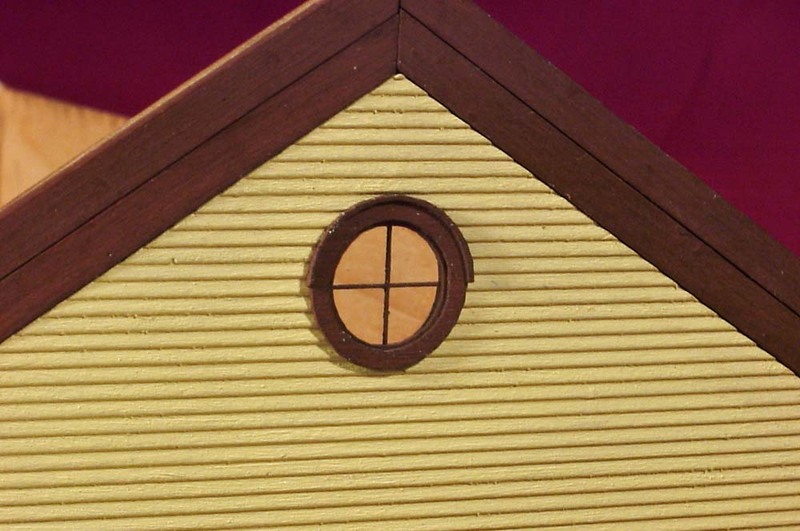 This little gem of a window is made up of five components; four pieces of laser cut 1/32" plywood and its laser cut acetate glazing. This is one of the three baggage door in the kit. It's made up of a frame, the scribed panel and a backing board. 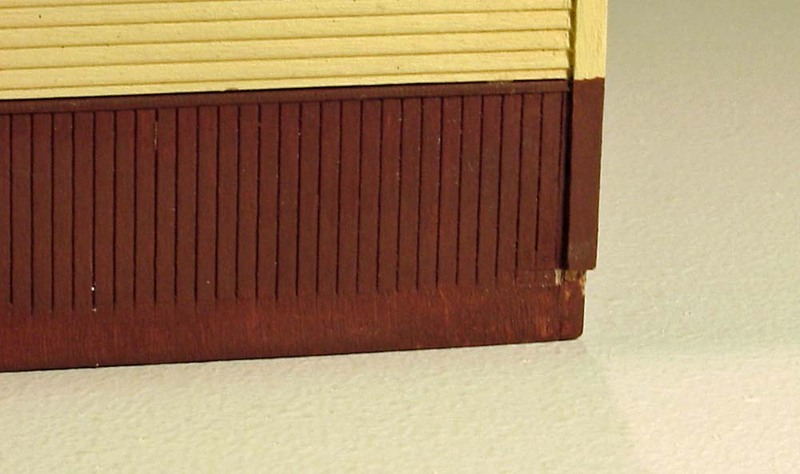 After painting the panel the primary building color, I used a dental explorer and the backside of a #11 X-acto blade to remove the paint from the laser cut grooves. It was attached to the inner surfaces of the structure with the laser cut peel and stic covered backing board. This and the following photo show how a simple support for the cast metal chimneys was constructed. 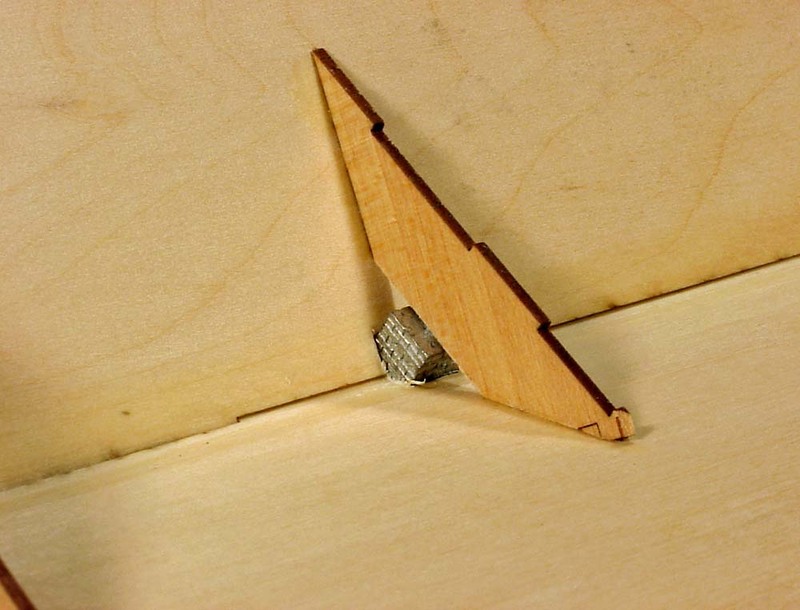 A scrap of the basswood was cut at the proper angles and glued to the underside of the roof. Once the chimneys are painted, they were inserted through their respective holes and secured with 5-minute epoxy. The baggage platforms are made from these elements. 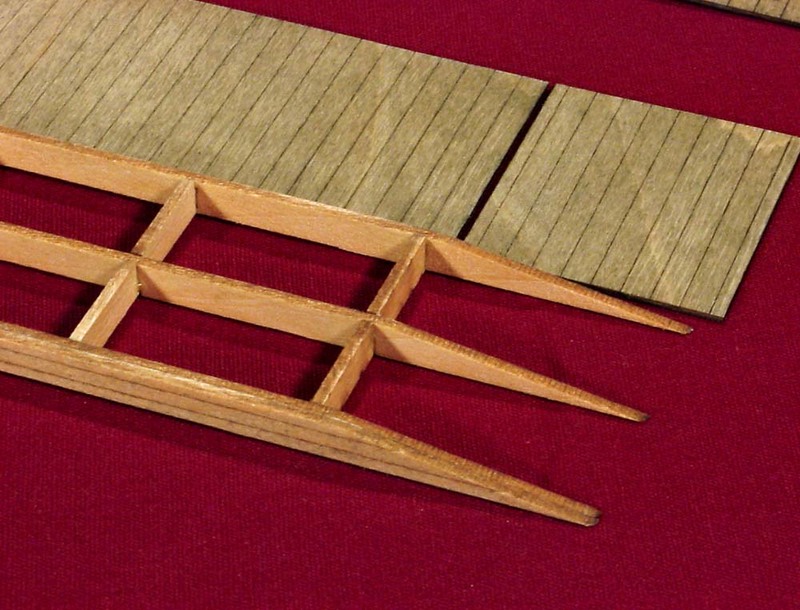 The framework is laser cut, interconnected 1/16" plywood and the decking is very thin, laser cut plywood. The pieces will be stained with a black shoe dye and alcohol solution, but the decking won't be glued to the framework until it is attached to the building. Here's a closer view of the platform framing components. 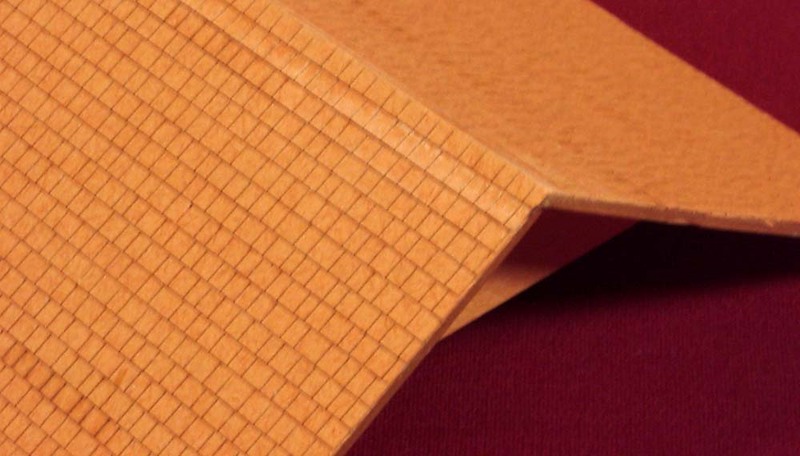 This is a small view of the laser cut shingles. I took the two roof sections outside and sprayed them with 3-M Super 77 Spray Adhesive. I encountered a problem when my shingling process reached the holes where the underside roof angle formers attached to the panels. I had forgotten to fill in the depressions at those points with spackle or putty to create a flush surface for the shingles. I paused my shingling and fixed the problem. The alignment lines were laser scribed into the roof panels and the application of the shingles took less than an hour. Rather than cap the roof with a piece of masking tape, I glued a final row of shingles to the top edge with white glue and trimmed off the excess once it had dried. Once the deck framing was completed, I noticed that it wouldn't fit tightly against the building. A sanding stick was used to remove enough of the wainscoting to allow for a proper fit. Once again the framework was test fitted before the decking panels were attached. 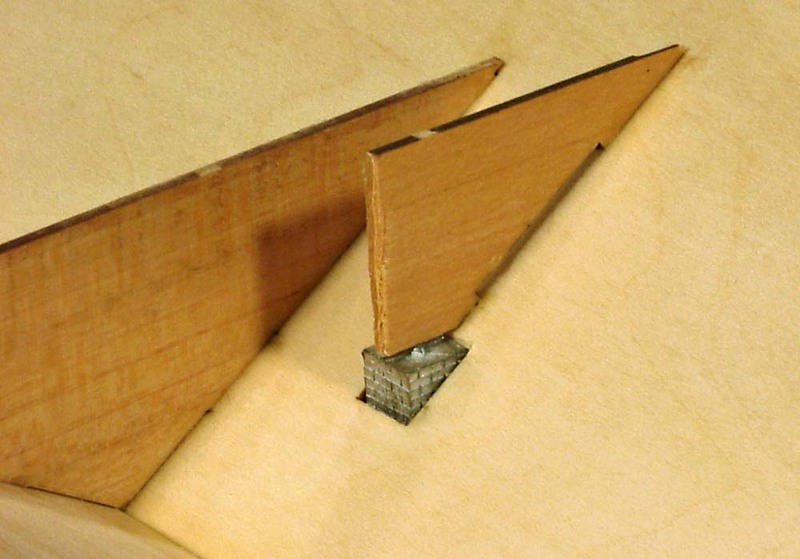 White glue was used to attach the thin pieces of plywood decking to the framework. 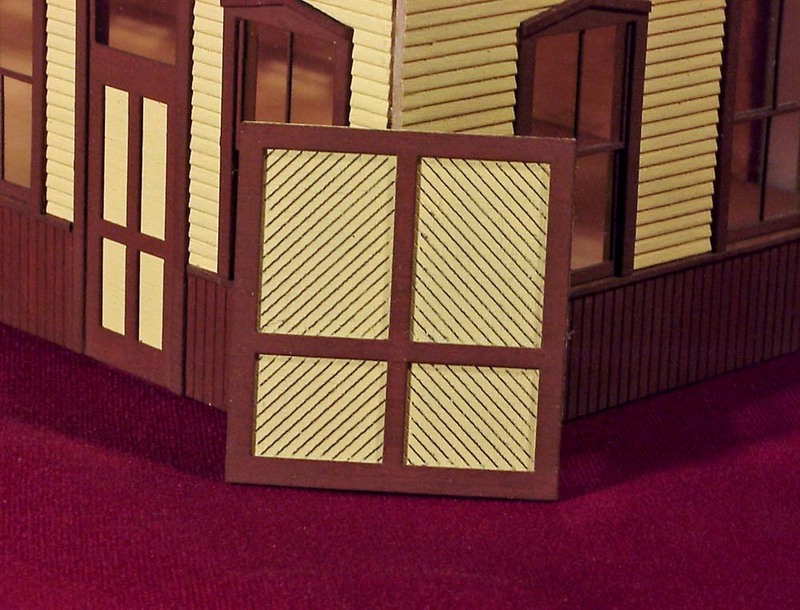 One of the neat features of this kit is the way the doors are designed and mounted. 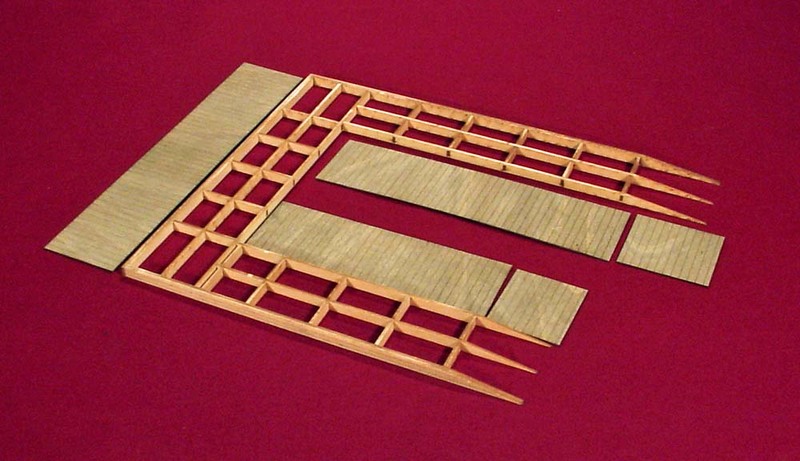 The frame is a peel and stick material and is attached to the outer wall. 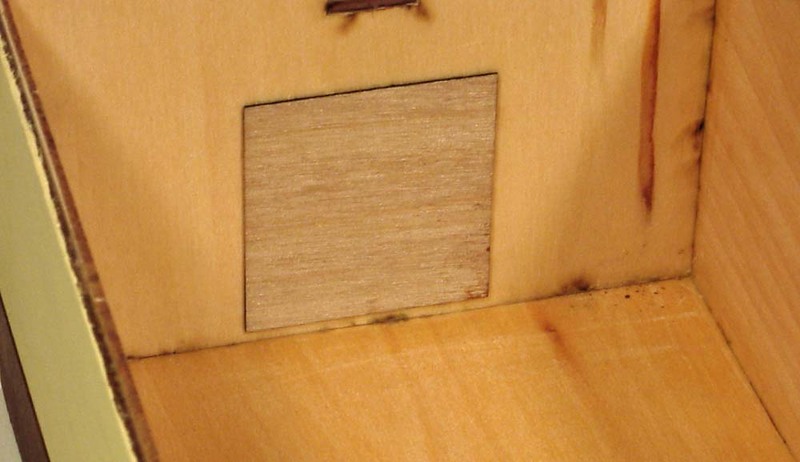 The door is the usual two part construction, but mounted to another peel and stick backing board and inserted into the opening from the inside. 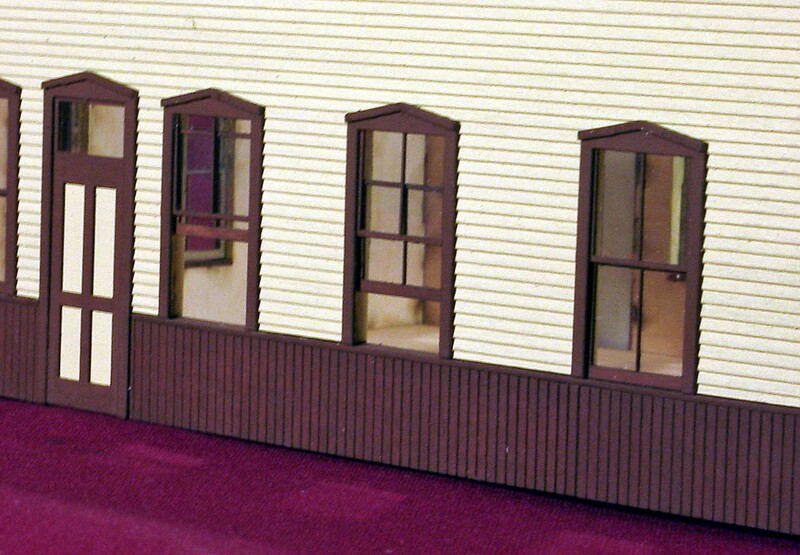 A few of the windows were constructed with the lower sash in an opened position. 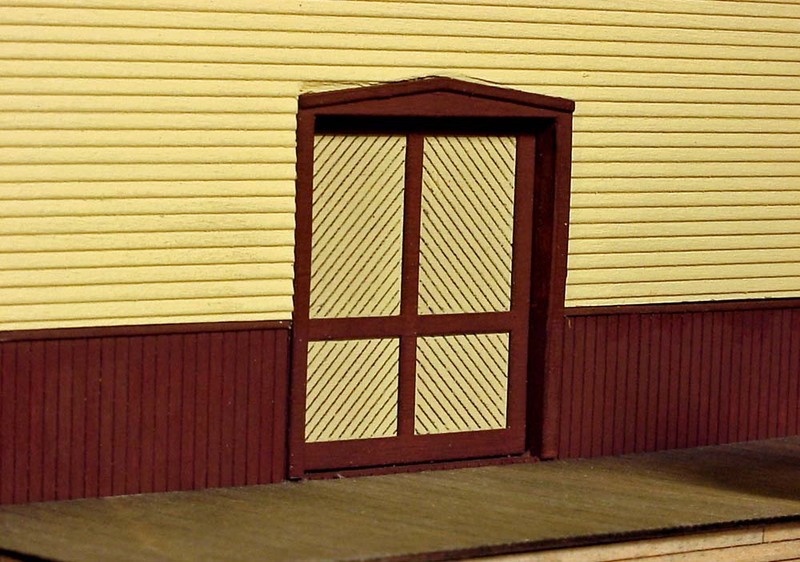 The doors were also attached to the inner wall surface with a backing support. This photo shows the backing board that's securing one of the baggage doors in place. 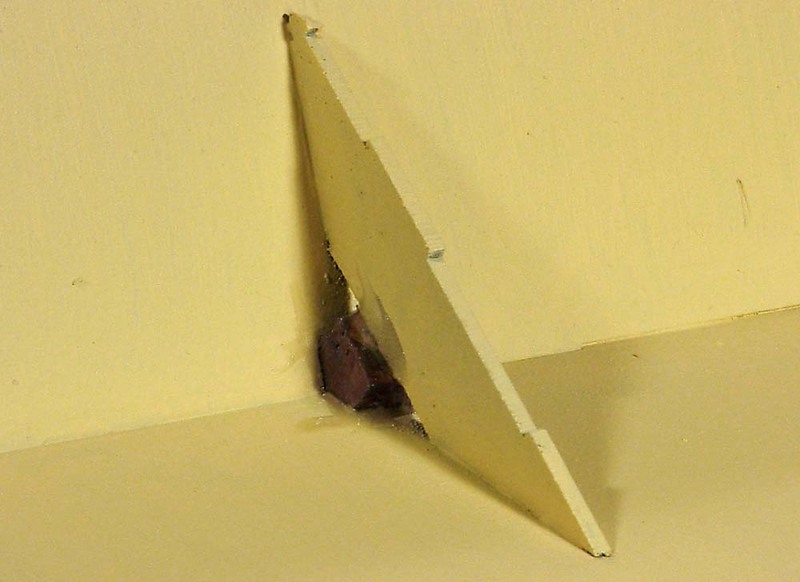 It's mounted with the sticky side facing the inner surface of the walls. The mold parting lines were removed from the metal chimney before it was scrubbed thoroughly with Comet type cleanser. It was then brush painted with Polly Scale ATSF Red. A very diluted wash of white paint was then applied to the mortar lines and allowed to flow into them. The casting was then given a light wash of black paint to suggest weathering from years of use. 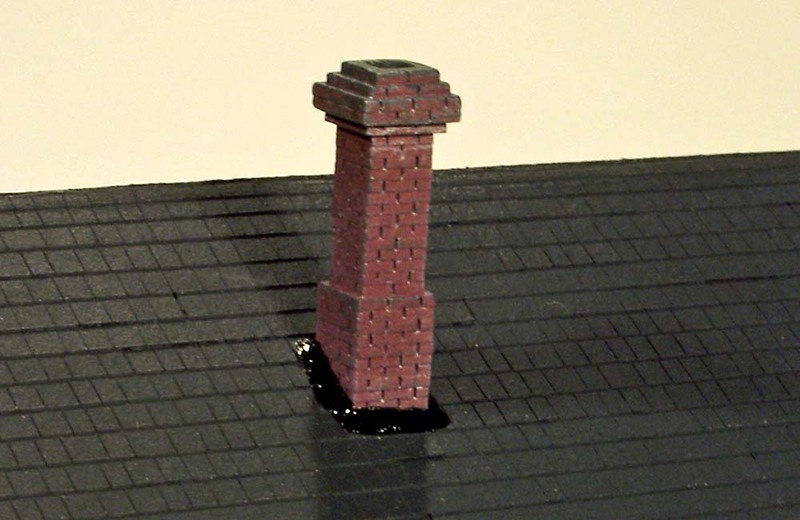 This view shows the chimney attached to the support with 5-Minute Epoxy. The epoxy was also carefully applied around the area where the chimney touched the roofing and painted glossy black to represent roofing tar. 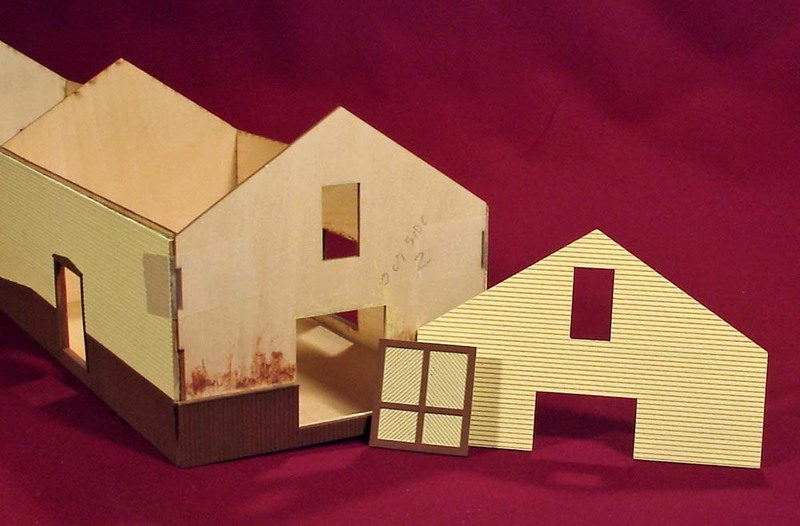 The final pieces that were attached were the laser cut roof braces. They are fragile and I didn't want to break them off while working on the other parts of the building. They were attached in their marked locations with yellow Carpenter's glue. This is a side view from the passenger room end. This is the other side view from the passenger room end. 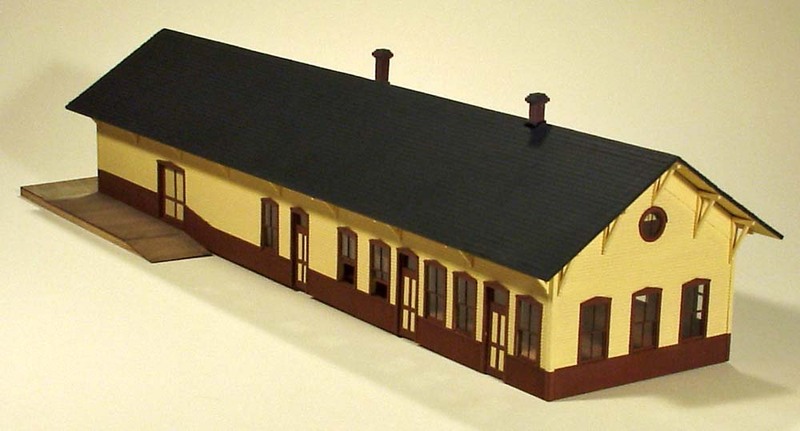 This is a side view of the building of the building when viewed from the freight room end. This is the other side of the building when viewed from the freight room end. 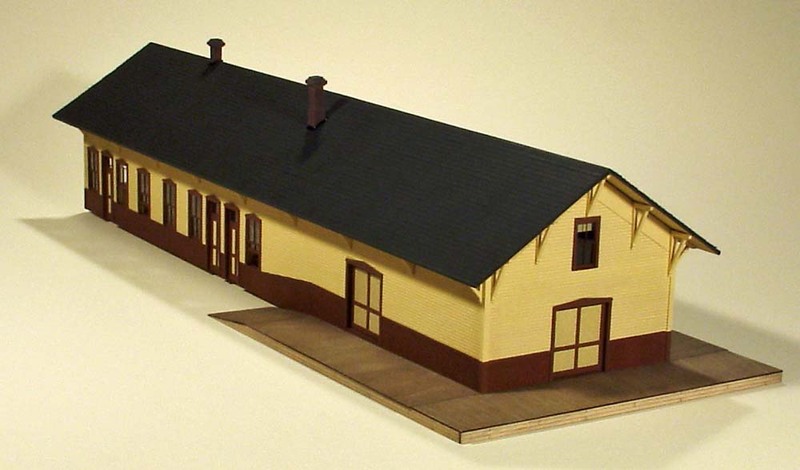 To see how the completed station would look on the layout, it was temporarily placed along the track at the end of a mine spur, high above the main line.